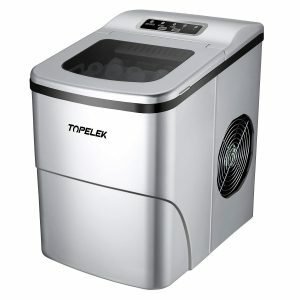 Silver Topelek Countertop Ice Maker (HPTECP173AHUS-USAS3) has a 26 lb. daily ice making capacity and gets your ice cubes ready within 6 minutes. It is rated 4.9 out of 5 stars by 15 customers at the time of this product review and customers seem to be mostly positive about this great ice maker. You can use it in your home kitchen, bars, cafes or on the go wherever you have a power outlet nearby. It has a large viewing window and a convenient and easy to operate LED display panel with On/Off and Select buttons and Add Water, Ice Full, Power, S and L ice size indicators. You can make ice for your cold drinks like soda, juice, ice tea, milk, wine, smoothies, iced food like fruits and sea food. You can also use the ice for first aid purposes- getting rid of pain and swelling. It works well in smoothie blenders where the ice cubes are easily crushed into your smoothies. 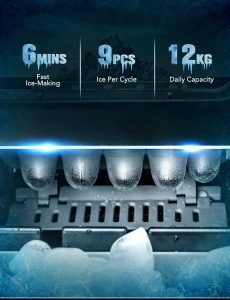 Topelek Ice Machine makes 9 hollowed-out bullet-shaped pieces of chewable and tasty ice per cycle, every 6 minutes (offers quick ice making) for a total of 12kg or 26lb. total ice. It has a very efficient, fast cooling, modern and ecologically friendly R600a compressor- refrigerant with foam insulation and copper condenser. You can select from two sizes of ice cubes, small (0.8” x 1”) and large (1” x 1.2”) for different uses. And the size of these ice cubes may vary a little depending on the ambient temperatures. The Ice Maker weighs 17.2 pounds and measures 8.7 x 12.6 x 12.3 inches, is portable and can have a permanent place on your kitchen bench as you may be using it frequently. You can move and store it easily when not in use. It has a large air vent at the rear and a high-speed exhaust fan on the right hand side for less energy consumption and better security. When you want to drain the remaining unused water you can easily unplug the drain plug and just plug it tightly after you’re done with draining the water. When the ice maker needs more water, the red Add Water indicator and when the ice making cycle is complete, Ice Full indicator will light up. It is best if you clean the interior of the ice maker and dry it after each use. It has a two liters (68 ounces) of water reservoir with an ice scoop and basket. It works quietly at 45 decibels of noise level with the built-in spoiler that reduces the noise significantly and you won’t be disturbed in your kitchen or living room. When you take it out of its box you want to put it upright and let it sit for up to 6 hours before starting to use it. The results may not be as expected for the first and second uses as it works just like a fridge (compressor) but it will be perfect after a few uses. It has a sturdy and durable ABS shell that is both smooth and easy to clean. Being made of food-grade materials, it conforms the health and safety requirements and you’ll smell no bad odors. You can contact their customer support team in case of any problems and they will be happy to help. You’ll see everything through the transparent window and can fill it with water and remove ice easily through the large flip top lid and opening. This is a good quality ice maker that looks good and works well and easy to maintain and clean, at a fair price and offers good value for money. It is offered with a warranty of two years along with a 30-day return guarantee if you’re not happy with the product.